She wanted to paint together. I sat down to answer emails. She wanted to do puzzles together. I vacuumed and washed and folded. She dragged the Play-Doh bucket from the playroom so we could make pizza Play-Doh…together. Writing projects, church projects, house projects, studying, filling out forms, answering emails, drafting letters, returning phone calls…I had my agenda. And she had hers, as she handed me a game she couldn’t play on her own and asked for help. Maybe we could do it together? Somehow I managed to perform periodic cleaning sweeps through the house in between requests for “together” this or that. We ate lunch at the school with her older sisters together (of course) and took a trip to the library after school with everyone. One brief moment of peace passed before I heard the sounds of fighting, ending in screams and tears. Following that, the post-fight therapy with daughters began, about whether they are loved as much as their sisters, and how come she gets away with this and didn’t I hear the mean things she said? Even the time that’s supposed to be free really isn’t when you’re a mom. Sometimes the whole idea of achieving balance seems like dreaming the impossible dream. When you’re truly responsible for other people, little people whom you love completely and utterly, you’ll be emptied out over and over again. Where’s the balance in that? The truth is life isn’t about balance at all. It’s about putting people first. I can’t say that I’m ending this day feeling very accomplished or on top of things, but then usually the most important things in life can’t be crossed off a to-do list. Yet, as we sat there having lunch at the school, my three-year-old climbed up in my lap and curled up tight. Her breathing slowed and drew in deeper and deeper until her head flopped forward into the crook of my arm. I scooped her up, carried her to the car and then into the house after the drive. If it’s possible for a tiny girl to coo, she did when I settled onto the sofa with her in my arms. Sometimes I’m telling that to wiggly daughters who have zoomed by me in their dash from the kitchen to the bedroom. I’ve reached out my hand, pulled them close and told them the secret message again and again. Other times, I’m whispering it to sobbing girls, upset, angry, hurt or feeling unloved. We all have people who need to hear those words from us: Teachers, friends, moms, sisters, dads, children, mentors, caregivers, coworkers, husbands…. Paul teaches us this in his letters to the churches. He writes with encouragement and challenges, correction, doctrine, and personal testimony, but also with thanks for the very people reading these words. 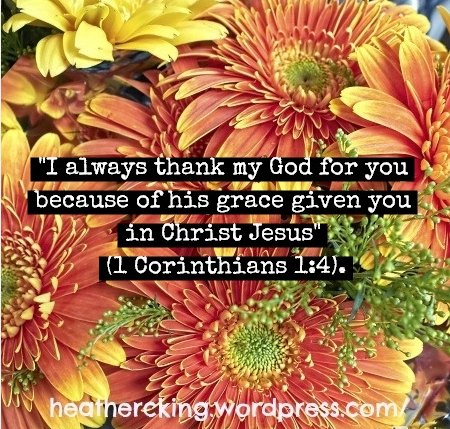 “I always thank my God for you because of his grace given you in Christ Jesus” (1 Corinthians 1:4). “We always thank God for all of you and continually mention you in our prayers. We remember before our God and Father your work produced by faith, your labor prompted by love, and your endurance inspired by hope in our Lord Jesus Christ (1 Thess 1:2-3). So often, we skim through the beginning and end of Paul’s letters, rushing through the personal notes so we can dig into meaty questions of doctrine and theology. But people mattered to Paul. That’s clear when you actually read his thoughtful recounting of the service, ministry, teaching, faithfulness, and generosity of individual people and the church as a whole. During this week of Thanksgiving, don’t just post a Facebook status thanking God for your husband and kids. Don’t be satisfied with saying just one word of gratitude before you pass the turkey and mashed potatoes. Tell others how thankful you are for them here and now. That’s more important than anything else on your agenda for the day. Who needs to hear you say, “I’m thankful for you” today? Thank you Heather. You alway encourage me and inspire me, AND remind me of the really important things. Thank you for taking time from your busy schedule to speak to me through your writings. May God’s blessing shine upon you and yours! Thank you so much, Linda! Happy Thanksgiving to you and your family also! !